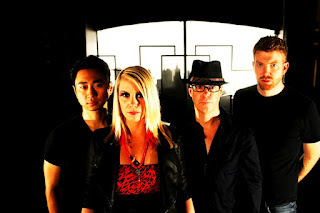 Quirky NY Chick: Audio Fiction To Release New EP, First Single Out Today! Audio Fiction To Release New EP, First Single Out Today! New York based rock band Audio Fiction (Kristin Wilson, vocals; Charles Park, guitar/vocals; Mark O'Toole, drums; Dean Perry, bass) are gearing up to release their third studio record, Worlds Apart, via Liminal Records at the end of the summer. With the help of a supportive fan base, the album was fully funded in February by a successful Kickstarter campaign. The first single and title song from the record, Worlds Apart is available now! You can check out the video for the track at the bottom of the post. Worlds Apart, produced by former bassist Darren Korb (creator of the award winning soundtrack to the hit video game Bastion) and mixed by Jeremy Parker, finds Audio Fiction delving into some darker waters. ""The old saying goes "art imitates life imitates art imitates life" - Sometimes life throws curve balls at you. It's not life's problems but it's how you deal with these obstacles that can define you. I was able to channel some of my feelings from a difficult time and my break up into a more dramatic fashion. The bitter-sweetness of our first AF album turned a little more bitter than sweet...." commented Wilson on the darker lyrical content. As always, Audio Fiction have given fans a well crafted piece of work that is a force to be reckoned with. They blend hauntingly beautiful, powerful vocals, a blazing guitar and incredible rhythms into the perfect mix of pop-rock perfection. The highlight for me is "Lying Awake." The rather upbeat song is so infectious that it begs you to hit the dance floor. GIG ALERT!!! Audio Fiction will be taking the stage at Pianos on Friday, August 24. They're a fantastic live band and for my fellow guitar fans, at some point during the show, Park will be unapologetic when he melts your face off.